Ivy Bridge meets Kepler. 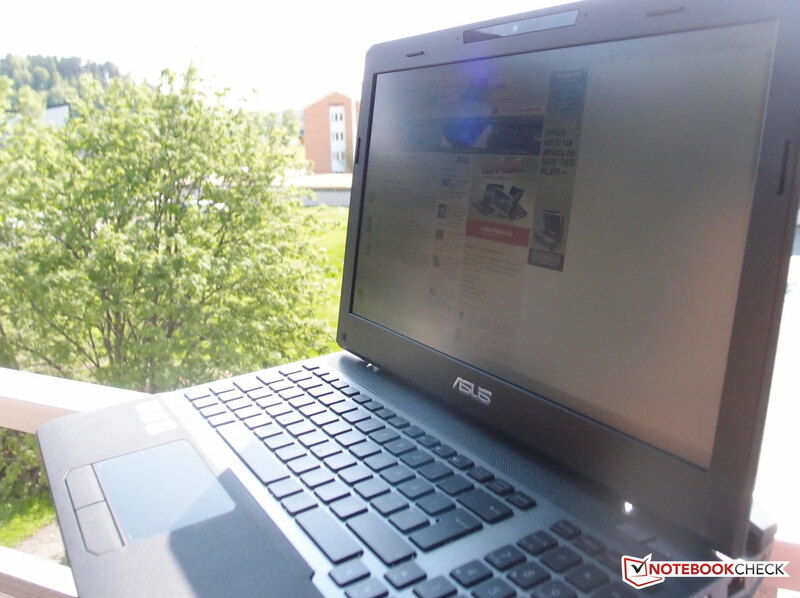 The latest revision of Asus' popular 15.6-inch Republic of Gamers laptop, now known as the G55VW, is large and heavy enough to belong in the desktop replacement category. However, this tradeoff in weight is compensated by an also large and very efficient cooling solution. 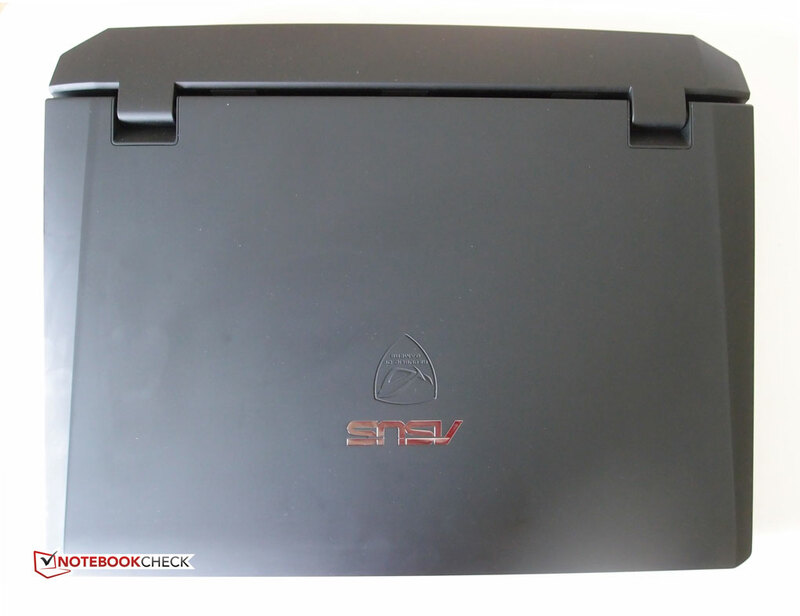 Although the G55VW's design has been updated compared to its predecessors, the G53SX and G53SW, Asus has kept the stealth bomber-inspired concept in black with large vents on the back of the laptop that tapers off towards the front. The cooling part adds to the laptop's weight and bulk, making it as heavy or even heavier than some 17-inch desktop replacements. This is not only a design choice, but fills a highly practical purpose, noted in the temperatures and noise section of this review. The most interesting news in the G55VW is of course the brand new hardware, including the new quad-core, 22nm Intel processor from the latest Ivy Bridge generation, the Core i7-3610QM. This is a die shrink of the predecessor Sandy Bridge and not a major leap forward in terms of performance first and foremost. 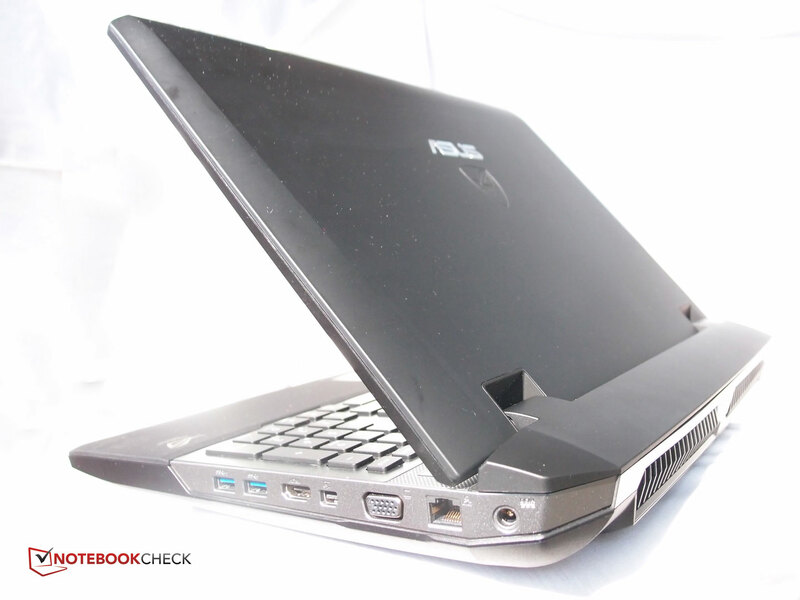 The biggest improvement is found in the processor's integrated graphics part, which is never used in this laptop. On the graphics side, the G55VW-S1020V comes with Nvidia's GeForce GTX 660M--a new mobile graphics card based on Nvidia's 28nm Kepler architecture. This is the entry model in Nvidia's high-end GTX lineup and should be a bit faster than the GT 650M, but still slower than the Fermi-based GTX 670M (a renamed GTX 570M). Even so, it has little in common with the GTX 560M found in numerous gaming laptops from previous generations, including the G53SX. Our test model is one of the Nordic versions of the G55VW, more specifically the G55VW-S1020V. Other than the keyboard layout there seems to be very few differences between the various model name extensions so far. Just different amounts of RAM and hard drive capacities. There is a lot to like about the overall design, but there are also some less inspiring aspects that have carried over from the G53. The G55VW looks like a smaller version of its big brother, the G75VW. The G55 borrows heavily from its predecessors, but Asus has updated the design by adding a recessed keyboard area in a brushed metal finish that extends down the sides of the laptop. 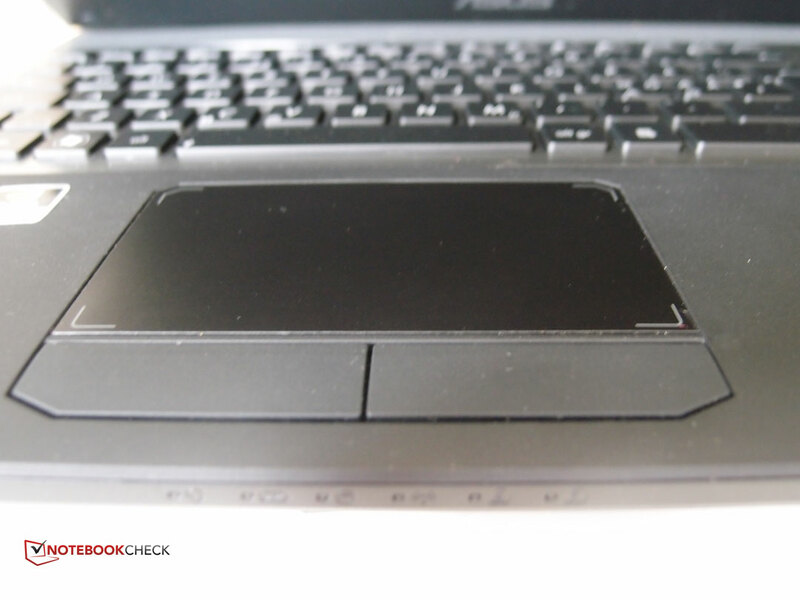 The upper parts of the laptop, including palm rest and lid, consists of a rubberized material that is comfortable to the touch and much less susceptible to fingerprints and smudges than glossy plastics. 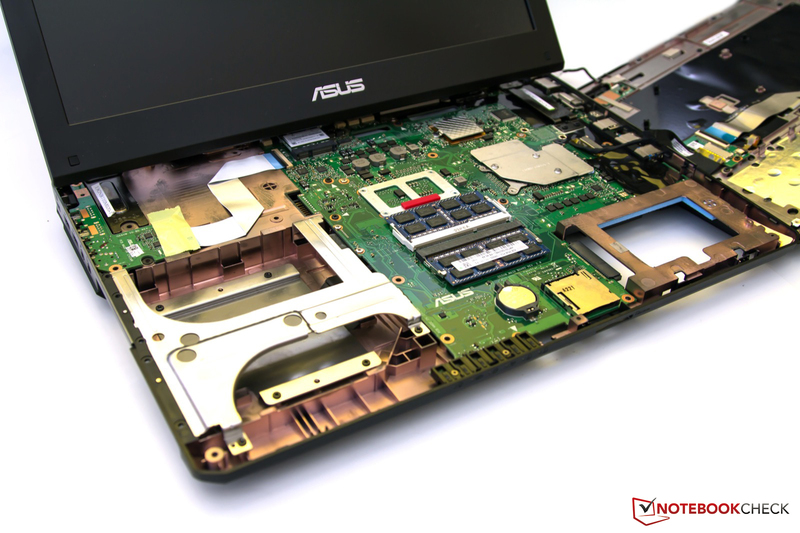 Another change for the better is found on the bottom side; it is no longer necessary to disassemble the entire laptop just to access the hard drive and RAM slots. A small hatch gives you easy access to the user-serviceable parts, but unfortunately not to the fans, which remain difficult to clean. Depending on your personal preference, the plain, low-key design is very elegant. Unlike some of its competitors, the laptop is utterly devoid of multi-colored LED lights and other colorful highlights. This once again proves that a gaming laptop doesn't have to "look the part" to be attractive to gamers, considering that the previous models in the series have all been very successful. One of the things that is less ideal is the size--although the screen is only 15.6 inches, the laptop's size and weight tell a different story. The G55VW weighs no less than 3.8 kg (8.4 pounds), which is heavier than some 17.3-inch desktop replacement laptops such as the HP Envy 17 or dv7. It also has a relatively large frame around the display and the cooling solution protrudes significantly from the back of the laptop. This also puts a limit on how much you can tilt the display backwards--the lid can only be opened to an approximate 120-degree angle. On the plus side, and perhaps in part because of its bulky design, the laptop feels very sturdy. There are no apparent flaws in the casing such as poorly joined plastic parts. The screen flexes a little bit when mild force is applied, but not enough to affect the impression of a solid chassis. There is little to complain about in terms of connectivity. All four of the G55VW's USB ports now support USB 3.0, as opposed to the predecessor that only had one USB 3.0 port and the rest USB 2.0. There is no FireWire port, which is not surprising, but an eSATA port would have been an added bonus if Asus had seen fit to include one. The G55 also provides ample choices for hooking it up to an external monitor; one of each is included: HDMI, Mini DisplayPort and VGA. 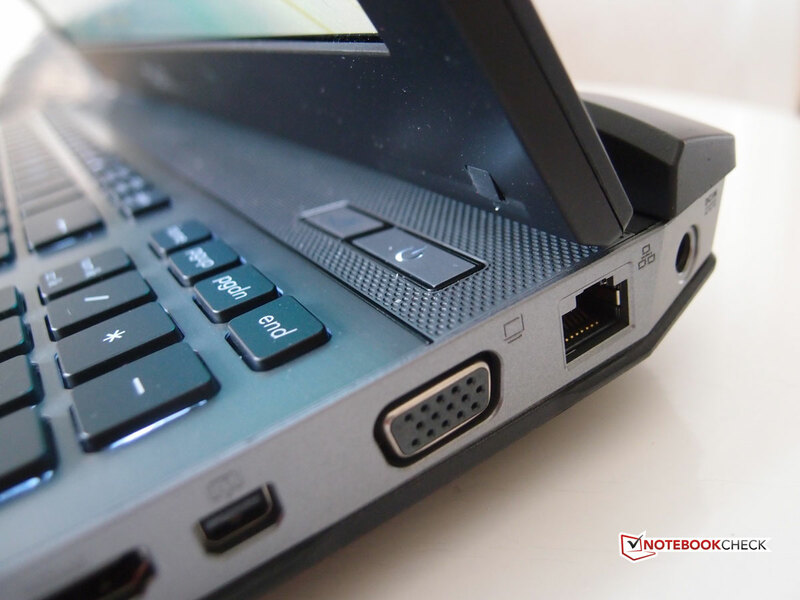 Many manufacturers have been ditching the VGA port on new laptops lately, but having one ensures backwards compatibility with older monitors and many projectors. The Mini DisplayPort is a welcome new addition for the opposite reason, as it helps you connect to newer monitors with very high resolution. Since the entire back portion of the laptop is occupied by the aforementioned large fans, there was no room for ports there. 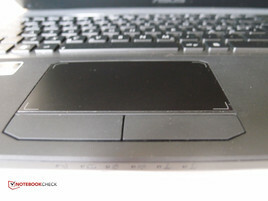 Consequently, all of them are placed along the sides of the laptop. This may be an awkward placement for the display outputs (all found on the right side of the laptop) depending on how your external monitor is attached. It is usually preferable to get rid of the monitor cable(s) by having them in the back. The two pairs of USB ports sit relatively tightly together, so inserting two USB memory sticks right next to each other may prove difficult. Other than a Gigabit LAN port, the G55VW is also equipped with a wireless module-- the Atheros AR9485WB-EG, which is a basic single-band 802.11 b/g/n card with one antenna capable of (theoretical) speeds of up to 150 Mbps. Bluetooth 3.0 support is also included. 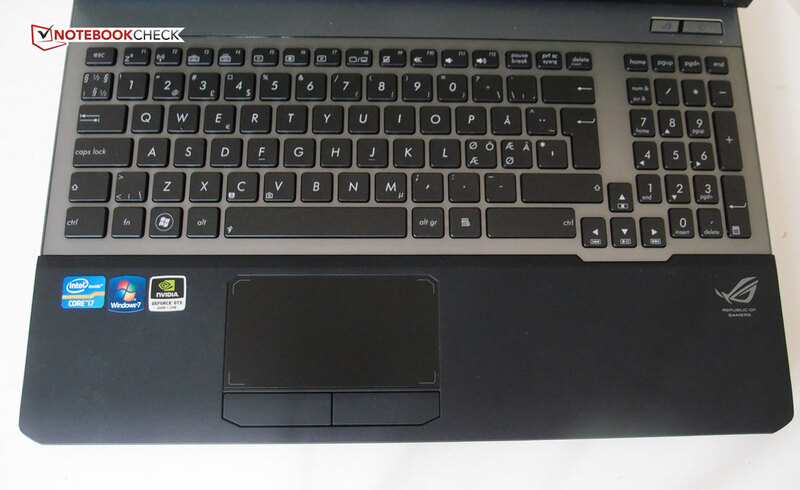 The G55's predecessor G53SX could only be serviced by removing the keyboard and loosening a copious amount of screws to get access to the internal components. This issue has partly been taken care of in the G55VW. The hard drive bay and two memory slots are easily accessible by removing just two screws. However, the G55VW also has an mSATA slot that is not accessible via the maintenance hatch. Also, before you go looking for the second hard drive bay that was present in the G53SX, the G55VW doesn't have one--there is just room for a single full-size 2.5-inch drive and one mSATA SSD. If it so happens that you don't love 'ASUS Vibe Fun Center', you will have to spend some time uninstalling that, a trial version of Trend Micro and a dozen or so pre-installed games from the 'Casual' category. To be fair, Asus is far from the only manufacturer that has the habit of shipping new laptops with profuse amounts of pre-installed junk, but that doesn't make it any more tolerable. Yes, I am very ungrateful for gratuitous copies of such timeless classics as Mahjong Memoirs, Turbo Fiesta and Dream Day First Home. Some of Asus' Republic of Gamers laptops have been known to ship with a suitable backpack and an external mouse, but this was not the case with the G55VW-S1020V. The package only contained a driver disk and a manual, in addition to the battery and power adapter. Keyboards with a dedicated number pad may feel cramped on 15-inch laptops, but it works reasonably well on the G55VW, perhaps because it is somewhat wider than average. The island-style keyboard, which is recessed relative to the palm rest, has uniform keys with a short travel distance that respond with a relatively quiet click. On the whole, the typing experience is pleasant, but it may have been even better if the keyboard was centered and lacked the numeric keypad. This is of course a matter of personal preference. Gaming or typing in the dark is made easier thanks to the backlit keyboard on the G55VW. Furthermore, the lighting is adjustable in three steps to accommodate for different ambient lighting conditions. 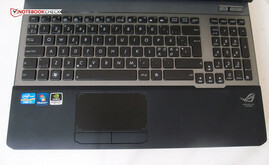 Unfortunately the keys are not uniformly backlit--some keys such as the right CTRL and '+' keys are darker than average. Some laptops are now equipped with individually backlit keys, but this is apparently not the case with the G55. Unlike Alienware (and lately MSI), Asus long ago opted out of more colorful keyboard backlight variations in favor of traditional white LEDs, which is clearly a good choice considering the rest of the design. The first thing that strikes you about the integrated Synaptics touchpad is that it's very large. It is also very easy to use, with a comfortable, semi-smooth surface that responds well to your touch. As is usually the case with modern touchpads, it also supports a number of multi-touch gestures such as pinch-to-zoom and two-finger scrolling. Another important part of any pointing device is its pair of buttons, and the G55 does not disappoint here. The buttons feel very solid, providing just the right amount of feedback and depth. They respond to clicks with a muted, low-pitched sound that isn't at all disturbing. Asus has chosen a matte TN panel from LG Phillips (with the model name LP156WF1) for the Asus G55VW-S1020 with a 1920x1080 pixel resolution and the standard 16:9 aspect ratio. Interestingly, the German model G55VW-S1073V is equipped with a different panel (LGD02D9), which is brighter but has a lower contrast ratio. In other words, two different models do not necessarily have the same panel. TN (Twisted Nematic) is the cheapest panel technology, as opposed to the much less common (at least in laptops) IPS (In-Plane Switching) technology, but the image quality varies also between different panels. The panel in the G55VW-S1020V looks great subjectively and the numbers also indicate that it's better than the average laptop display, even if it doesn't break any records. In terms of color space, the display is very close to covering the sRGB spectrum, but far from covering AdobeRGB, which is not surprising. 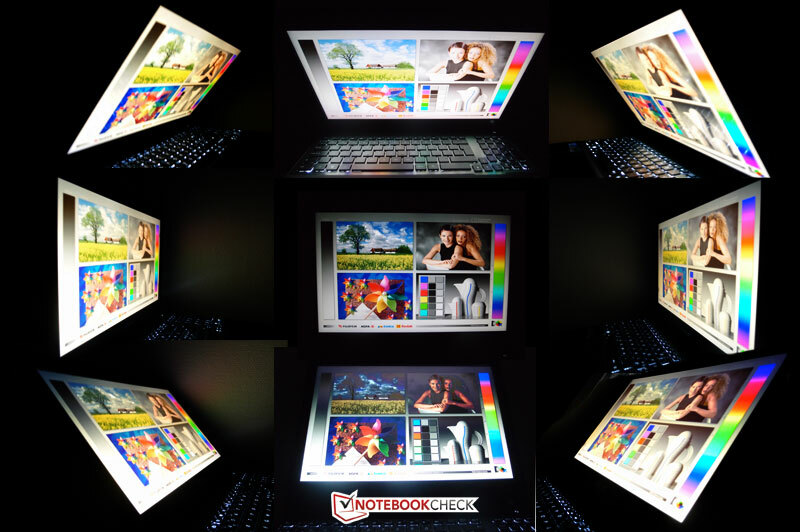 The 3D version of the G55VW's big brother, the G75VW 3D has a better panel overall, with better brightness and a slightly wider color spectrum. The average brightness in the G55's panel is still good, even if it comes out as a little bit uneven in our measurements. Another highlight is the black level at 0.48 cd/m2, which results in an excellent 792:1 contrast ratio. Outdoor use is actually possible thanks to the matte panel with a high average brightness. Like most displays it becomes hard to read in direct sunlight, but using the G55VW in the shade is not a problem. On the other hand, the mobility factor is hampered by the laptop's weight and relatively poor battery life. As you would expect from a TN panel, the viewing angles are far from perfect, but in this case they are more than sufficient. Colors become washed out or distorted on the vertical plane, but the horizontal viewing angles are a lot better. The panel in the G55VW is far ahead of such abysmal displays as the one in the old Envy 14 and many others like it. Intel's 3rd-generation Core i7-3610QM is the entry-level model in the quad core Ivy Bridge lineup, but that doesn't mean that it is slow in any way. The 2.3 GHz base clock is automatically increased up to 3.3 GHz in single-threaded applications thanks to the Turbo Boost feature, or several steps in-between depending on the current load. These clock speeds can be compared to the 2.2 GHz and 3.1 GHz (Turbo Boost) in the Sandy Bridge predecessor, the Core i7-2670QM. Ivy Bridge is a die shrink of its predecessor Sandy Bridge and not an all new architecture, but Intel is now using 3D ('tri-gate') transistors and the production process is down to just 22nm, compared to 32nm for Sandy Bridge. 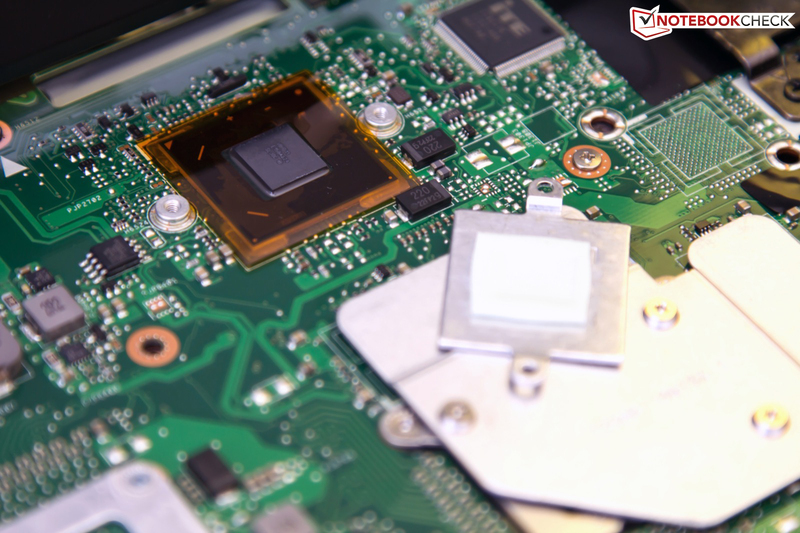 The biggest improvement is found in the graphics part of the chip, which is never used by the G55VW because it uses the Nvidia card exclusively (no Optimus/switchable graphics support). 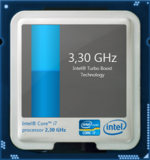 There is no question that the i7-3610QM is a very powerful processor. The four physical CPU cores can handle eight threads thanks to Intel's Hyperthreading technology, so the operating system treats it as an 8-core processor for practical purposes. 6 MB of L3 cache is the same amount as the corresponding model from the Sandy Bridge generation (2670QM), and the same goes for the faster 3720QM. The L3 cache is increased to 8 MB starting with the Core i7-3820QM. Since the graphics core is inactive in the processor, there are no other major performance enhancements to report in the Core i7-3610QM, but the clock speeds are higher than its predecessor while it retains the same power consumption (TDP). Intel's Turbo Boost feature has improved a great deal since the (re-)introduction in the 1st-gen Core i7 series. The processor now has more leverage than ever to increase its clock speeds on demand. In this case, that means that the CPU overclocks itself from 2.3 GHz up to 3.3 GHz in single-threaded loads, or to other steps if several cores are in use, as long as it stays within the thermal constraints. We can see this in Cinebench, where the processor goes to 3.1 GHz and stays there even though all of the cores are in use. These high clocks would have been unthinkable with the first Core i7 models with Turbo Boost technology. It seems that today, the base clock frequency is mainly a power-saving feature--this CPU can and does run at considerably higher speeds even under full load. To test the limits of a system we apply an extremely high load by running Furmark and Prime95 simultaneously. This is an unnatural level of stress that is almost never achieved under normal circumstances (including gaming), but if there is a weakness this test should expose it eventually. 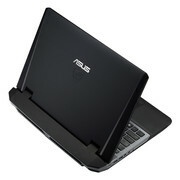 Asus has a reputation for throttling the clock frequencies to keep the laptop running within its power and thermal boundaries, but unlike the Asus G75VW, no throttling can be observed even when the G55VW is excessively tortured and the processor cores hover around 95 degrees C. The GTX 660M reaches around 77 degrees, i.e., nowhere near dangerously high temperatures. It seems that the huge cooling solution is doing a great job, as it should. The Core i7-3610QM is clearly a very fast mobile processor, especially when considering that the base clock speed is exceeded consistently when the CPU is working. At this writing, there are only a few mobile processors that can compete with the 3610QM, namely the faster CPUs in the Core i7 series (including the fastest models from the Sandy Bridge generation). As expected, the benchmark scores put the processor on par with similarly clocked CPUs from the previous generation or slightly higher. For example, the G55VW's Cinebench R10 score is a bit better than the Schenker XMG P511 (2760QM, GTX 570M) and marginally slower than the MSI GT70PH with the same processor as the G55 but a GTX 670M GPU. The result in the x264 HD benchmark was 127/32 fps in pass 1/2. 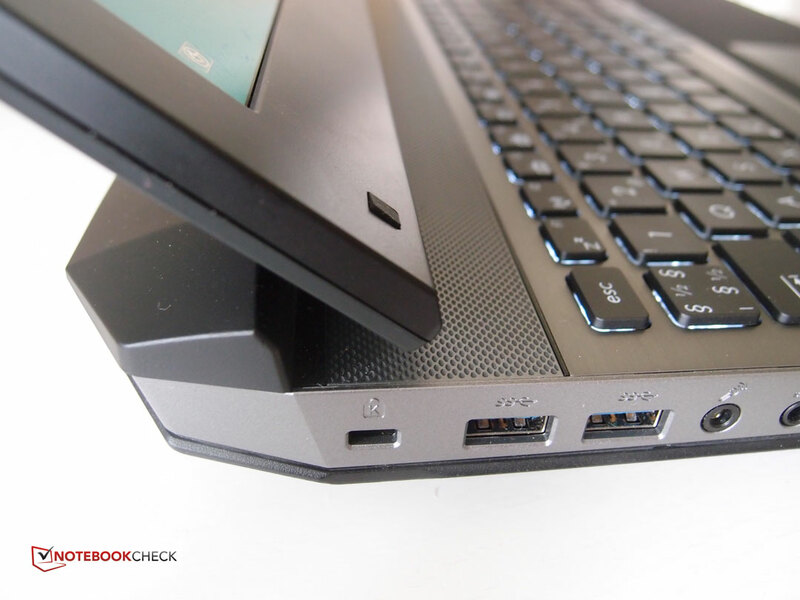 The PCMark scores are greatly affected by the laptop's storage device, i.e. laptops equipped with a solid state drive consistently produce much higher PCMark scores compared to those with mechanical hard drives. The same goes for the extremely simplified Windows Experience Index, where systems with mechanical drives are capped at 5.9. 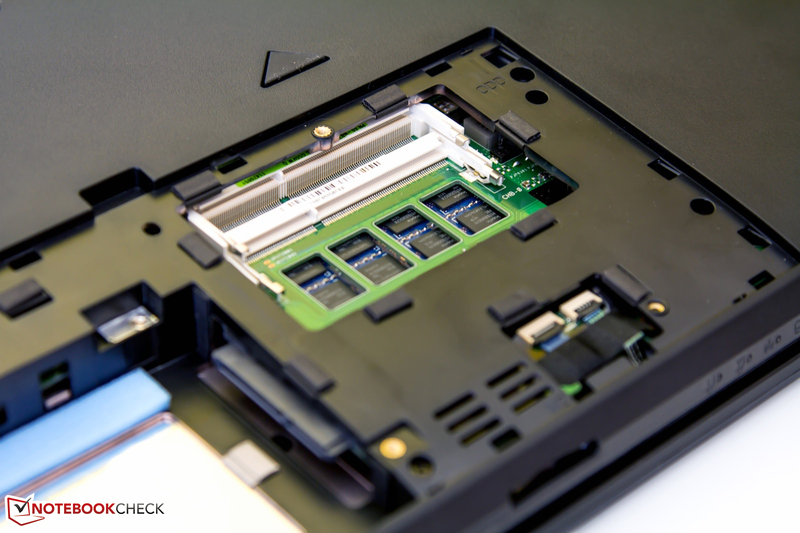 Storage performance is the weakest link in the G55VW due to the simple fact that it has an ordinary mechanical hard drive instead of an SSD. A solid state drive confers a huge performance improvement to the storage subsystem, which is reflected in (subjectively) ultra-fast system responsiveness and also in general system performance benchmarks such as Futuremark's PCMark Vantage and the Windows Experience Index, as previously mentioned. The 750 GB hard drive in the G55VW-S1020 is a Seagate ST9750420AS that spins at 7200rpm. In other words it's a fast hard drive spinning at desktop drive speeds, but it will still never come close to the speeds offered by a modern solid state drive. Its average data transfer rate (according to HDTune) is 90.7 MB/s--a fraction of the 500 MB/s offered by some recent SATA III 6 Gbps SSDs. 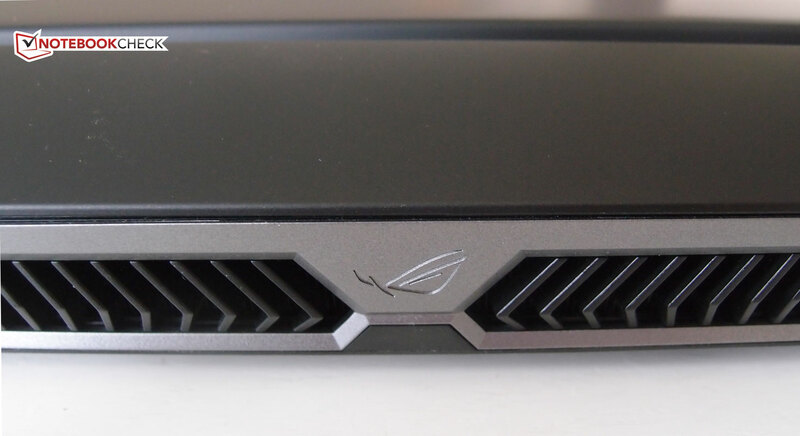 Asus has also removed the option for a second hard drive that was present in the G53SX, but instead added an mSATA slot where you can install an SSD cache drive. Unfortunately this slot is located on the opposite side of the motherboard (facing the keyboard), making it very difficult to access. Unlike the current Nvidia GeForce GTX 670M and GTX 675M, which are essentially renamed GTX 570M and 580M GPUs, the GeForce GTX 660M is based on Nvidia's new Kepler architecture. This does not mean that it is faster than its designation--the 660M is still slower than the 670M--but it should offer more performance per watt compared to the older GTX 560M. Kepler graphics chips are produced in 28nm instead of Fermi's 40nm and come with some additional architectural improvements. Compared to the GTX 560M, the GTX 660M has 384 CUDA cores instead of 192, but the doubling of the shader count is limited by the fact that the clock speeds are no longer higher in the shader domain. However, the core clock speed is also higher in the 660M--835 MHz vs. 775 MHz in the 560M. The 660M is coupled with 2 GB of GDDR5 running at an effective 2000 MHz clock frequency and the memory bus width is 128 bit. In comparison, the GTX 560M came in two variants: one slightly slower 2 GB version with a 128-bit memory bus (found in the predecessor G53SX) and a faster 1.5 GB version with a wider 192-bit memory bus. The GTX 660M therefore performs better than the GTX 560M in general, which is evident in the Futuremark 3DMark scores. Our average GTX 560M has produced a score of 9230 points in 3DMark Vantage and 1842 points in 3DMark 11, while the GTX 660M-equipped G55VW outperforms the GTX 560M by about 25% and 38%, respectively. This is of course a major improvement, particularly in the more up-to-date 3DMark 11 which relies less on the processor when calculating a final score. The G55VW is part of Asus' Republic of Gamers series, so gaming performance is high on the list of priorities for this laptop. What ultimately decides how well those games will run is the GeForce GTX 660M, and in the following tests we intend to find out what this new GPU is capable of. Although it is a newer graphics card, the 660M is slower than the older GTX 670M (previously known as GTX 570M), but not by much. As seen in the 3DMark scores, the 660M is considerably faster than the 560M and should be sufficient for all but the most demanding gamers, who should instead opt for a laptop with the new AMD Radeon HD 7970M or the Nvidia GTX 675M/580M. However, moving from a 660M to a 670M is an unconvincing alternative, as it will use more power and produce more heat, but only offer relatively meager performance gains. Bethesda's fifth installment in the Elder Scrolls series uses a DirectX 9 engine that is not overly demanding for a modern graphics card. The G55 has no problems running it in 1920x1080 resolution and high settings and even the Ultra setting is within reach. By tuning down the AA/AF settings from the default Ultra setting, the game offers perfectly playable frame rates. Metro 2033 was released in 2010, but it is still one of the most demanding titles we've come across--especially when you turn on DirectX 11 features. While the game runs fine at lower settings and full HD resolution, the highest setting is completely unplayable. Crysis 2 is another game that isn't too demanding in its original form, but quickly becomes unplayable for most mobile graphics cards once you turn on the highest settings. With high-resolution textures and DX11 features turned on, the game isn't even playable with the GTX 675M/580M, but it still looks and runs great with the GTX 660M using native resolution and medium settings. The latest Batman game has the advantage of a built-in benchmark tool that passes through scenes of varying complexity. According to this tool, the G55 provides a playable average of above 30 fps even at the highest setting. However, it is not fast enough to keep up with the highest resolutions when PhysX effects are added to the mix. Deus Ex: HR can run in either DirectX 9 or DirectX 11 mode with tessellation, and the latter works fine on the G55VW regardless of the setting. Even with all the post-processing effects turned on the GTX 660M produces playable frame rates. One of the best parts of the Republic of Gamers laptops is that they are very quiet compared to most (if not all) other gaming laptops. The G55W is no exception and keeps the noise level to a minimum even during intense workloads including gaming. The reason can be attributed to a great cooling solution with the characteristic large vents in the rear, which seem to be able to blow out all excess heat with very little effort. As long as the laptop stays idle or close to it the fans are barely audible. When running Furmark and Prime95 simultaneously the fans reach their highest setting and noise level, but they never become loud enough to be particularly disturbing. Similarly, the temperatures are kept to a minimum thanks to the oversized cooling solution in the G55W. Only the upper middle part of the keyboard goes above body temperature, where the heat becomes perceptible and potentially uncomfortable, and this is during the extremely resource-intensive stress test. The palm rest stays far below those temperatures. On the whole, the cooling system in the G55VW is simply great and quite possibly worth the price you pay in the form of added weight and bulk. (+) The maximum temperature on the upper side is 35.4 °C / 96 F, compared to the average of 39.3 °C / 103 F, ranging from 21.6 to 68.8 °C for the class Gaming. (-) The average temperature of the palmrest area of similar devices was 28.7 °C / 83.7 F (-2.7 °C / -4.8 F). The speaker system has been beefed up compared to the previous models, but just like the G75VW there is a problem with the speakers in the G55VW: when the subwoofer is active, its volume can't be adjusted with the volume control in Windows (this only controls the stereo speakers). The subwoofer's volume has to be adjusted separately in the included VIA HD Audio Deck utility--in "expert mode" no less. This has to be a problem with the drivers and an update from Asus will hopefully address this issue. Another problem is that the speaker grills are located behind the display, which of course lowers the overall sound quality in front of the laptop. At least the speakers are louder than average. 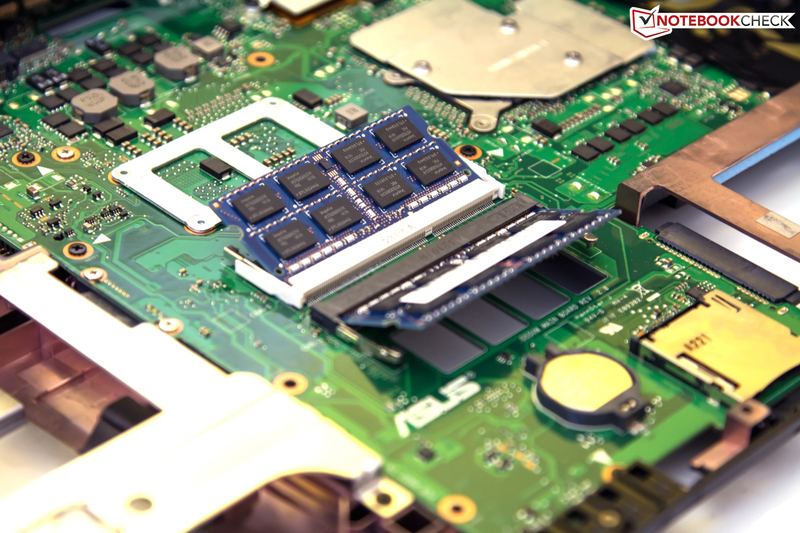 All gaming laptops require a respectable amount of power to operate, even if the power consumption remains far lower than in a comparable desktop system. The G55VW comes with a large power brick rated at 180 Watts, which appear to be sufficient. During light loads with display brightness set to the highest setting, the laptop doesn't use much more than 30W, but this number increases to well over 100W when you apply some load. For some reason, Asus has chosen not to include Nvidia's Optimus feature (switchable graphics) in the G55VW, meaning that the GTX 660M is active all the time and does not switch to the integrated Intel GPU to save power, even when running on battery power. Since the 660M uses more battery juice than the Intel IGP, the battery doesn't last as long as it could have. In Battery Eater's 'Reader' test, with virtually no activity, no WLAN, minimum display brightness and all power-saving measures active, the G55VW stayed alive for 3 hours and 44 minutes. In a more realistic scenario--web surfing with medium display brightness--the laptop ran for 2 hours and 38 minutes. Oddly enough, the German version of the G55 performed better in all of the battery tests in spite of using the same methodology. The different panels could explain some of the difference, but other factors could also be in effect, such as differences in battery cell configuration. That Asus hasn't enabled Optimus is unfortunate, since the battery would no doubt have lasted longer if the laptop had been able to utilize the graphics part of the processor. Gaming is not possible when running on battery power anyway, due to automatic clock speed reductions in the GTX 660M. 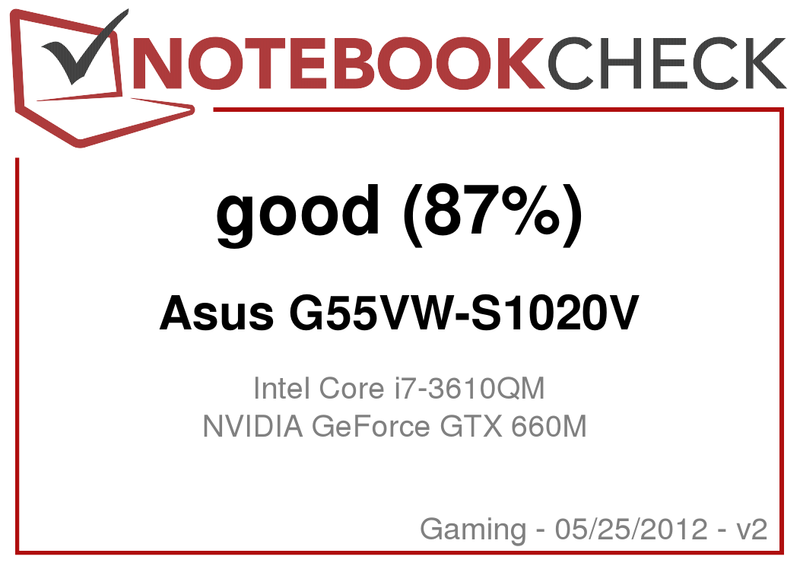 The G55VW is clearly an improvement over the G53SX, and anyone who is in the market for a 15.6-inch gaming laptop should definitely consider it. However, all would-be owners should also be aware that they're getting a 15-inch laptop that is far heavier than average. The difference in weight compared to the 17-inch G75VW is quite small (3.8 kg vs. 4.35 kg). 15-inch laptops are more commonly found in the 2.5 kg to 3 kg span, so that's quite a bit of extra weight to carry around. But, (and in case you skipped to this part right away), the G55VW has an ace up its sleeve in the form of an absolutely brilliant cooling solution. It is quite possible that the G55VW is the only laptop in this category that runs as cool and quiet. Neither has Asus compromised on the hardware. Although you could argue that this is one of few 15-inch laptops that could handle a GTX 675M or HD 7970M without nearly melting, the combination of the new GTX 660M and Core i7-3610QM offer lots of performance at an attractive price point. The new design is appealing compared to the predecessor. Although it is easy to see that the G55VW and the G53SX are from the same series, the inlaid brushed metal highlights gives the new model a more striking appearance. Another plus is that the port selection now features a DisplayPort output and only USB 3.0 compatible USB ports. The new and improved design. The fact that the 15.6-inch Republic of Gamers laptop is still the most silent-running gaming laptop on the market. Great performance. A lower weight, perhaps by using lighter materials. The large frame around the display feels outdated. It is surprising that Asus hasn't activated the switchable graphics feature Optimus. 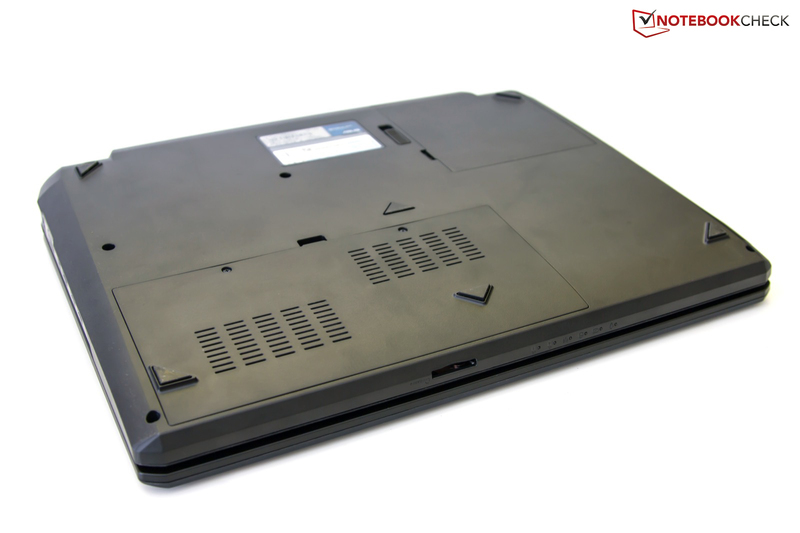 The 15-inch Clevo P150EM is configurable with much faster GPUs, but is not nearly as cool and quiet as the G55VW. Another alternative with approximately the same weight is the 17-inch MSI GT70.